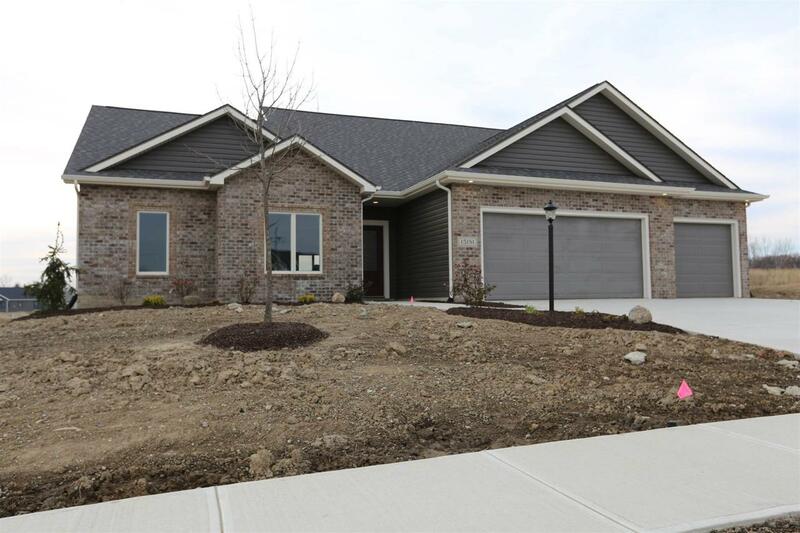 Beautiful new split bedroom ranch home located in Lakes of Leo Creek Villas. This gorgeous home sits on a beautiful pond lot. This is a brand new floorplan with an open concept. Greet your guests in the spacious foyer of this pristine home. Just off the foyer is a den which would be a wonderful home office. The kitchen features a custom maple painted with glaze cabinets, quartz countertops, tile backsplash, 42" upper cabinets, island and breakfast bar. The great room has a tray ceiling with crown moulding and a beautiful fireplace with a floor to ceiling brick surround. The owner's suite has a luxurious master bathroom with a porcelain tile shower, double sink vanity and linen closet. The views from this home are spectacular overlooking a pond. Sit on the covered veranda and watch the sunset. Other features of this home include: 8x5 pantry, cabinetry in the laundry room, 9' ceilings, extra 24x9 patio and yard irrigation. Listing courtesy of Elizabeth Urschel of Century 21 Bradley Realty, Inc.